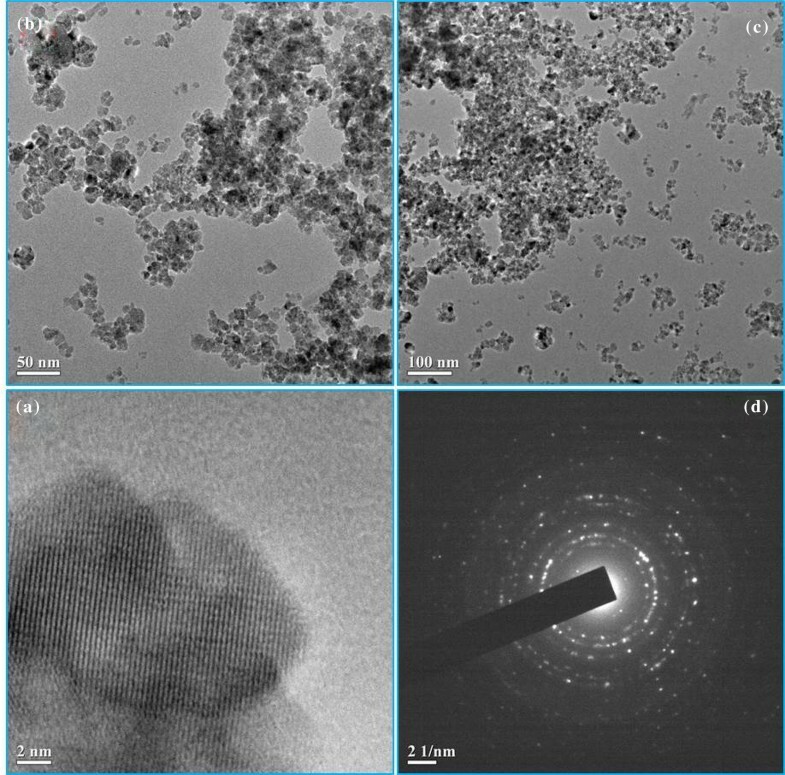 The synthesis of cobalt ferrites (CoxFe3-xO4) materials with sympathetic size and tunable magnetic properties is used for the promising industrial and biomedical applications. Such cobalt ferrites nanoparticles have been employed by co-precipitation technique. XRD analysis revealed that the average crystallite size of synthesized powder is 9 nm using (311) peaks, and it has exhibited polycrystalline structure. FTIR spectroscopy showed the formation of ferrite phase with high- and low-frequency bands at 573 cm−1 and 455 cm−1, respectively. The TEM images exposed that the materials have been well agglomerated along with spherical-shaped nanoparticles. EDX study confirmed the presence Co, O, Fe and C with stoichiometric composition and no more impurity detected in the spectrum. The VSM analysis revealed that the sample exhibits the hard magnetic materials. In addition, the magnetic anisotropy increases (19.05 → 344.84 erg/g) when Co is added with Fe3O4. EPR spectroscopy confirmed the ferromagnetic behavior of composites. 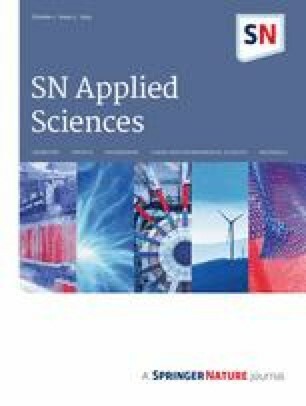 Nowadays, nonpolluting vehicles have been constructed using advanced magnetic spinel materials. The cobalt ferrites were formed by face-centered cubic structure through oxygen ions filled together with the divalent and trivalent metal ions in the tetrahedral and octahedral voids, respectively. Cobalt ferrite (CoFe2O4) nanocomposites are broadly used in a variety of applications, such as transformer cores, magnetic sensors, stress and biomedical sensors, catalytic insulators, information and energy storage media, solar energy conversion, coatings, recording heads, antenna rods, loading coils, microwave devices, ferrofluids, magnetic refrigeration, drug delivery, gas detectors, cellular therapy, tissue repair and hyperthermia treatment. Cobalt ferrite spinel is a promising material for various commercial applications [1, 2]. For materials calcined at 900 °C, there is a slight move of the 311 peak toward lower edges, credited to the migration of Co2+ cations from octahedral to tetrahedral voids and to a contrary exchange of a proportional number of Fe3+ particles so as to loosen up the compressive strain. 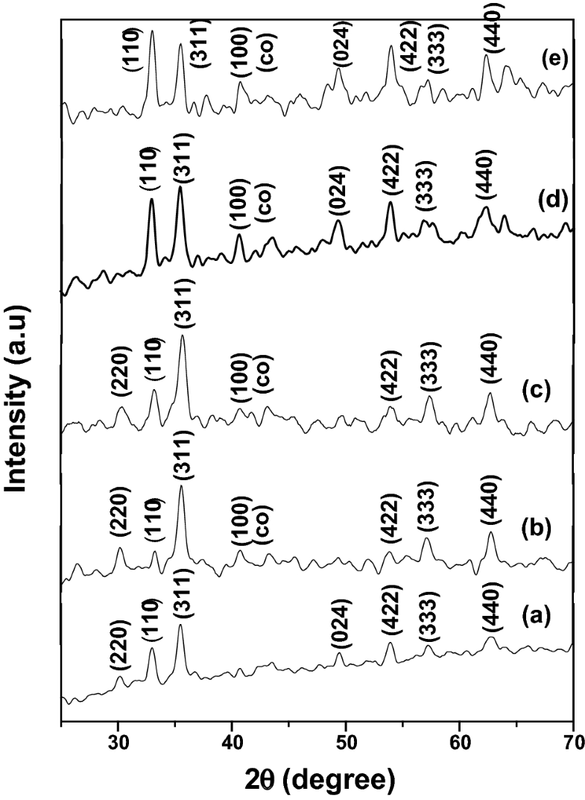 It demonstrates the variety of crystallite sizes and lattice parameters with CoFe2O4 content (X %). By calcining temperature, at 700 °C, the evaluated lattice parameters of CoFe2O4 are underneath the theoretical value (8.39 Å) as per JCPDS NO. 22-1086, because of the progressions of Co2+ and Fe3+ cations circulation among tetrahedral and octahedral destinations. In cobalt ferrite structure, Fe3+ and Co2+ can possess both tetrahedral and octahedral sites [3, 4]. The exchange of cations framework is said to be a spinel structure. Normally, cobalt ferrites (CoFe2O4) exist in the spinel oxide family and every unit cell containing 32O2−, 8Co2+ and Fe3+ ions. The cobalt ferrite molecule framed the Fe3+ [Co2+Fe3+] O2−; here, Fe3+ cations occupy half of the octahedral fashion and tetrahedral fashion. CoFe2O4 is an example of an inverse spinel structure [5, 6, 7, 8, 9]. In view of its high magnetocrystalline anisotropy, saturation magnetization, high coercivity, substance soundness, mechanical hardness and chemical stability, cobalt ferrite (CoFe2O4) spinel is a promising material for different business applications. Its magnetic properties are for the most part dictated by the Co2+, and along these lines, the tuning of its magnetic characters by modifying the Co/Fe proportion ends up conceivably. By warm treatment, the CoxFe3-xO4 is gradually changed in two iron-rich and cobalt-rich spinel stages . For the gel that contains a high abundance of Co, the hysteresis loop demonstrates expansive coercive field, yet the magnetic subsidiary outline exhibits sharp peaks, conceivable as a result of the existence of CoFe2O4 as a single magnetic phase. In favor of samples calcined at 700 °C, the saturation magnetization declines, and the decline pattern of the saturation magnetization could be a result of the diverse cation distribution .The exchange of the different cations in the spinel matrix is responsible for the fascinating magnetic performance of the different ferrites . These magnetic cations were exchanged between the voids in various experimental methods, and also an exchange of cations depends on doping materials, annealing temperature and duration of time . Magnetic cobalt ferrites have been synthesized by a variety of methods, such as mechanical milling, co-precipitation, hydrothermal methods and sol–gel techniques. Among this, co-precipitation is the most convenient technique when compared to others by controlling the size of the nano particles . The polyvinylpyrrolidone (PVP) is added with CoFe2O4 as a stabilizer . These ferrite materials have been widely used in various technical applications in magnetic refrigeration, detoxification of biological fluids, magnetically controlled transport of anticancer drugs, magnetic resonance imaging contrast enhancement, magnetic cell separator, magnetic devices, switching devices, permanent magnets, hard disk, recording media, read–write heads, active component of ferrofluids, color imaging, gas-sensitive materials, etc. [16, 17, 18, 19].In the present work, a novel co-precipitation technique is utilized for the arrangement of CoxFe3-xO4 nanoferrites. The reactants utilized are modest, nonlethal and eco-accommodating. The grain sizes of the arranged ferrites are in the request of a couple of nanosizes. The combined ferrites are checked for their virtue and organization. The nanoferrites are found to have high caliber and great stoichiometric piece which purifies the inclination of this technique. Ferric sulfate monohydrate (Fe2(SO4)3.H2O, assay: 99%),cobalt (II) sulfate heptahydrate (CoSO4.7H2O), ethanol, ammonia, polyvinyl pyrrolidone (PVP, (C6H9NO)n, assay: 98%) were purchased from Sigma-Aldrich Chemical company. All chemicals are used without any further purification. Nanoscale particles were prepared by chemical co-precipitation method. The number of moles of all reagents of sample and the corresponding chemical formula are shown in Table 1. 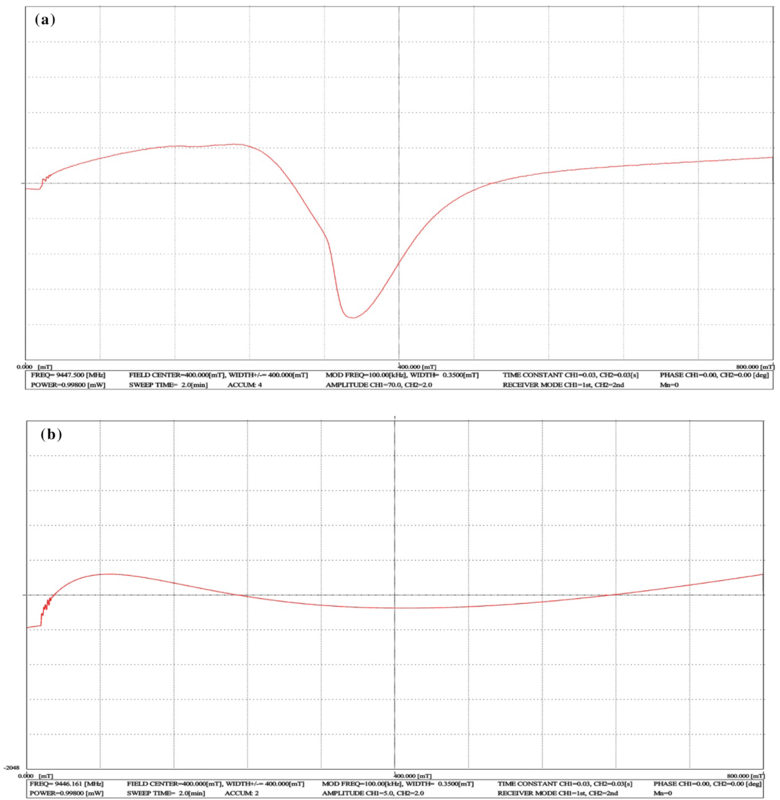 In an experiment, aqueous solutions of 100 ml containing the ferric sulfate, cobalt (II) sulfate heptahydrate (x: 0.00 ≤ x ≤ 0.04), respectively, and polyvinyl pyrrolidone (PVP = 0.0025M = 1 g) were mixed with 250-ml conical flask with stoichiometric proportion. The stoichiometric mixtures were stirred for 45 min to obtain a homogeneous solution, and the ammonia (0.25 M) was dissolved in 50 ml of distilled water and added slowly to the mixtures for maintaining the pH level at 11 of materials. Under vigorous mechanical stirring for 3 h at room temperature, the solution appears in black color; this is the required condition for precipitation of the nanoparticles. The precipitates were then magnetically alienated using a magnet bar. The alienated materials were dissolved in methanol and then again alienated with magnet bar. This process was continuously done for four times in order to eliminate the excess amine molecules. Finally, we got a black powder of CoFe2O4 after drying the precipitate at room temperature for 6 h. The dried powder was kept at muffle furnace and annealed at 600 °C for 4 h in order to obtain pure-phase high-crystallinity CoFe2O4 ferrites. Therefore, annealing operation removes all structural imperfections by complete recrystallization. where β is full width at half maximum measured in radians and θ in degrees. A micro-strain (lattice strain) means that the distance of the relevant crystal planes is not identical which is possibly due to the presence of defects and stress. Furthermore, the overall decrease of the lattice parameters occurred when the bigger ion (Co2+→70 nm) is partially substituted by the smaller one (Fe3+→60 nm). To legitimize the presence of Co2+ particles in our tail compound, we think about the effectively detailed FTIR spectrum of pure Fe3O4  for comparison as appeared in Fig. 2. FTIR spectroscopy is used to study the surface chemistry and different bonds existing in the nanoparticles . 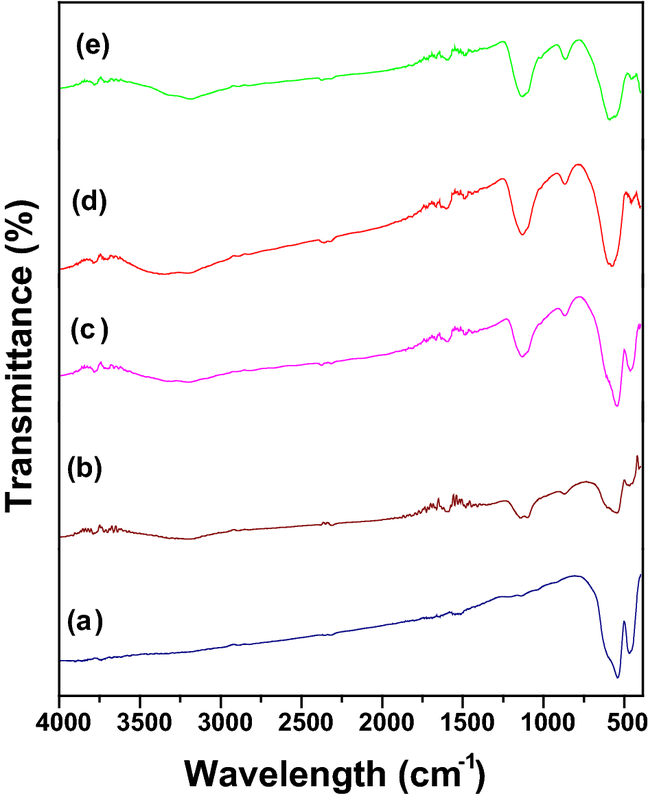 The Fourier-transform infrared spectra of CoFe2O4 nanoparticles were recorded in the frequency range in between 400 and 4000 cm−1. The subject of the absorption spectrum reveals that positions of the cations in the crystal through the vibration mode. 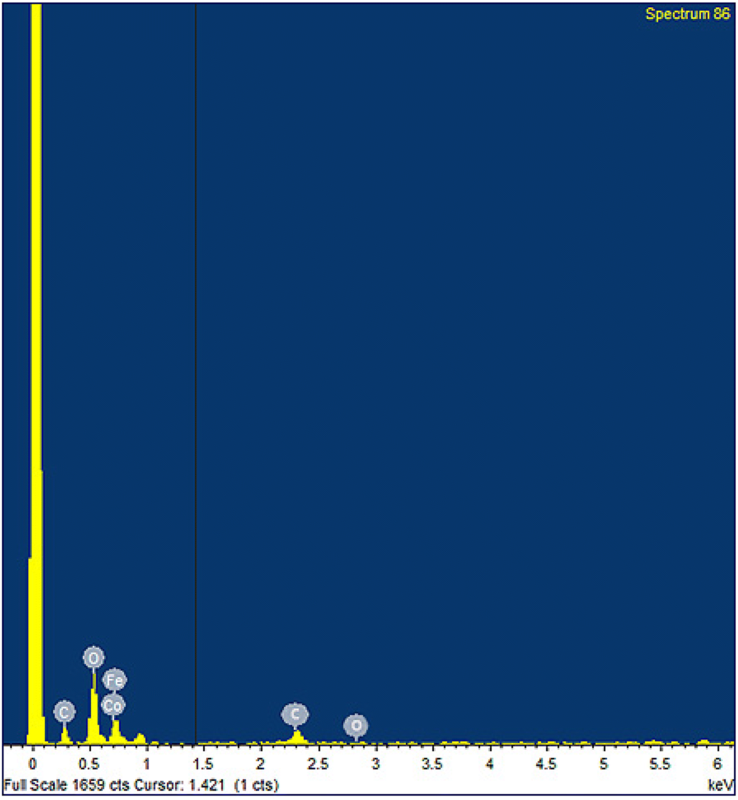 The strong peaks about 573-538 cm−1 wave number were due to the stretching vibrations of the metal at the tetrahedral voids (Fe–O–Co) with the high-frequency bands, and the stretching vibrations of the metal complex (Fe–O–Fe) at the octahedral voids appear lower with frequency bands at 468-455 cm−1 which confirms the phase of CoFe2O4 [24, 32]. It helps to improve their magnetic property to have inverse spinel structures. The stretching of C–O bond at 1136 cm−1  and 867 cm−1 was assigned to deformation of Fe–OH groups . The peaks at 1594 cm−1 were assigned to stretching and bending vibrations of absorption water on surfaces of nanostructures . The vibrational frequencies associated with cobalt ferrite material centered at 3191 cm−1 are due to O–H stretching. The infrared absorption frequencies and the corresponding vibrational assignments of CoFe2O4 nanoparticles are shown in Table 3. Figure 3a–c shows the morphology of CoxFe3-xO4 (x = 0.03 M) which was observed by a picture of TEM, correspondingly. The particle size is varied from 2 to 50 nm which is evident from our work reported  for Fe3O4 nanoparticles. The domain wall morphology has positively oriented domains that grow up, and the negatively oriented ones shrink. The nature of CoFe2O4 particles becomes regular, and the allotment of particles is uniform. The Co2+ cation is doped with Fe3O4 pure ferrites, and the nanoparticles achieved spherical shape and good agglomeration. Hence, the estimated particle size decreases from 100 to 2 nm. It reveals that the particles exhibited the super-ferromagnetic nature . These nanosized particles form nanocluster in order to reduce the interfacial energy connecting the personage nanocrystals with the desired size of particles and are used in drug delivery applications . The patterns of selective area electron diffraction (SAED) of the samples are shown in Fig. 3d. 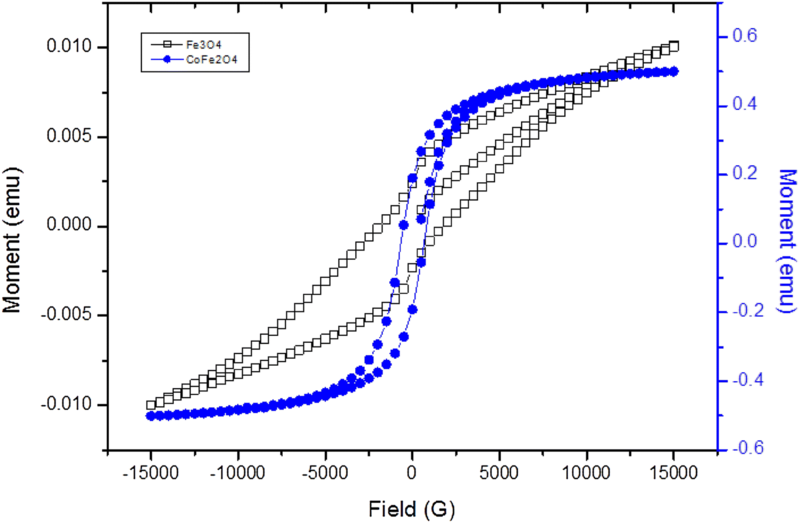 The polycrystalline nature of a pure CoFe2O4 with high crystallinity is revealed. And the bright spot is also obtained with Debye ring pattern which represents polycrystalline nature of the samples. Chemical purity along with stoichiometry of the CoFe2O4 nanoparticles was examined by EDX spectroscopy. We found that Co, Fe, C, O elements alone are present in the sample as shown in Fig. 4. The EDX study also confirmed that the precursors used in the synthesis have entirely undergone the chemical effect to form the single-phase nanocrystalline cobalt ferrite. Magnetic anisotropy depends upon the magnetic properties. It gives some valuable information about the orientation of the field with respect to the crystal lattice. From Table 4, magnetic anisotropy increases (19.05 → 344.84 erg/g) when Co is added with Fe3O4. This is due to the fact that Hc decreases with increase in magnetocrystalline anisotropy . The hysteresis loop is very narrow, so the loop area is less. Hence, hysteresis loss is minimum where as coercivity and retentivity are small, having low eddy current loss results all samples are exhibited to soft magnetic materials. This is the important consideration when the materials can be used for microwave frequency applications. where (h) is the Planck’s constant, ν is the frequency; H is the resonance magnetic field and β is the Bohr magnetron. The EPR spectra of CoxFe3-xO4 (where x = 0.03 M) are shown in Fig. 6. The strong dipole interactions give g value and a huge resonance line width, while strong super-exchange interactions produce a small line width and g value (g = 2.40). This suggests that the magnetic particle spins interact with O2−. Hence, magnetic materials exhibit to ferromagnetism as the result of unpaired electrons spins can be induced between tetrahedral and octahedral sites. Generally, the magnetic dipolar interactions and super-exchange interactions between the magnetic ions through oxygen ions are the two important factors that determine the g values and the resonance line width (H). The super-exchange interactions generally increase, when the distance between the magnetic ions and oxygen ions decreases. From the EPR spectra, all the samples display a sharp symmetrical signal and a broad asymmetrical signal with a slight shift from the free electron position (g = 2.0023). The ferromagnetic behavior of the samples is confirmed through the g values (g = 2.812). The line width and the g values obtained for the samples may be attributed to the ferromagnetic resonance due to Co2+ ions . The PVP-coated cubic inverse spinel cobalt ferrite nanoparticles were acquired by chemical co-precipitation technique. XRD results show that the particle sizes fall in the range from 19 to 5 nm. The FT–IR spectroscopy expresses the relative occupancy between half of Co2+ ions in the tetrahedral along with octahedral fashion through their lower and higher vibration modes. So these materials behaved as ferromagnetic materials about the inverse spinel structure of the cobalt ferrite. The TEM is exposed to a good formation of agglomerated spherical nanosphere. EDX confirmed the occurrence of Co, Fe, C, O elements alone in the sample. The VSM results reveal that the hysteresis loop of the samples was disturbed by doped Co2+ at the room temperature, resulting in the increase of exchange interaction connecting two sites. The EPR spectra at room temperature confirm the occurrence of ferromagnetism from the g value of Co-doped Fe3O4 nanoparticles. We remain grateful to the Administration of St. Joseph’s College of Arts & Science (Autonomous), Cuddalore, Tamil Nadu, India, for providing the ‘Research Lab for Nanotechnology and Crystal growth’ laboratory for synthesis of nanomaterials in our work. And the authors are indebted to PG & Research Department of Physics, Arignar Anna Govt Arts College, Villupuram, for proving laboratory facility.